MainAll NewsMiddle EastAssad Finally Losing His Grip on Syria? Assad Finally Losing His Grip on Syria? Syrian regime suffering major losses, which experts say show its utter reliance on Iran and susceptibility to influence of its neighbors. 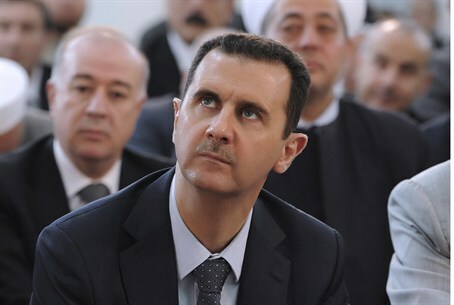 Syrian President Bashar al-Assad's regime was reeling Thursday from a series of military setbacks, after rebels seized a major provincial capital and a key border post in less than a week. Experts said the losses were a reflection of the regime's weariness after more than four years of civil war and increasing regional efforts to counter Iran's backing for Assad, reports AFP. The taking by rebels late Wednesday of the last border crossing with Jordan in loyalist hands and three days earlier of provincial capital Idlib have dealt major blows to the regime, experts said. And Wednesday's seizure of parts of a Palestinian refugee camp inside Damascus by the Islamic State (ISIS) group has shown the growing reach of a jihadist force already in control of large parts of Syria and Iraq. "It's indicative of a problem the regime has that has been increasingly obvious - it has a manpower shortage," said Noah Bonsey, a Syria expert at the International Crisis Group. Rebels seized the border crossing with Jordan after heavy fighting, leaving the government with no presence on a key frontier. It was the latest regime loss in the southern Daraa province, after rebels took the ancient town of Bosra al-Sham last week and seized an important army base in January. And Saturday's capture of Idlib in northwestern Syria by Al-Qaeda's affiliate, Nusra Front, made it the second provincial capital in rebel hands after ISIS-controlled Raqa. By taking the city, Nusra was able to consolidate its hold over a large area of Syria bordering Turkey after heavy street fighting and regime air strikes that reportedly killed at least 130 people. Yezid Sayigh, senior associate at the Carnegie Middle East Center, said the military setbacks are "significant losses for the regime" even if "they don't change the overall strategic picture." "The regime still retains important assets, while the rebels are still limited by organizational and manpower problems. But the real implication is that both are badly weakened and unable to achieve a decisive breakthrough anywhere," he said. Bonsey said the losses in Daraa and Idlib were part of "a larger pattern" of the regime being pushed out of areas where it cannot commit significant forces or count on backing from its regional allies, Iran and its Lebanese-based Shi'ite terror proxy Hezbollah. "The regime is increasingly dependent on Hezbollah, foreign fighters and non-Syrian militias facilitated by Iran to accomplish military objectives," he said. "But in places like Idlib, Hezbollah and Iran are not willing to invest with boots on the ground." Sayigh said Nusra "has emerged as a backbone of the armed rebellion, especially in Idlib province" and noted that the group has a "superior organization and battle command." "In Syria we see a trend towards three main armed camps: the regime, ISIS, and other groups that are gradually drawing under an umbrella in which Nusra is the leading group." Increasing support for rebels from some of Syria's neighbors, like Jordan and Turkey, and Gulf countries is another key factor behind recent gains, experts said. "There has been a regional decision between Saudi Arabia, Qatar, Jordan and Turkey to stop the Syrian regime from advancing," said Syrian Observatory for Human Rights director Rami Abdel Rahman. He said the rebels had been recently supplied with new weapons from Jordan and Turkey. "Regional powers want to retake the initiative. It's a message that they want to stop advances by Iran, the regime's ally, in Syria but also elsewhere like Yemen" where a Saudi-led coalition is bombing Tehran-backed rebels, he said. Secular rebels have been increasingly pushed aside in the opposition by jihadists, in particular ISIS, which declared an Islamic "caliphate" straddling territory it controls in Syria and Iraq. The ISIS threat to the regime was highlighted Wednesday when the group's fighters for the first time seized territory inside Damascus itself at the Yarmuk Palestinian refugee camp. The jihadists managed to capture most of the camp before being pushed to its edges Thursday in a fightback by Palestinians loyal to Islamist terrorist group Hamas and other rebel factions.